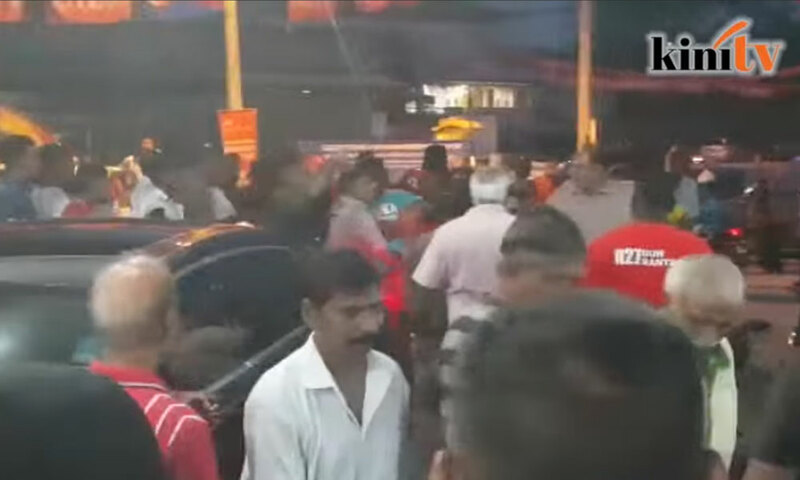 The fight that broke out outside Pakatan Harapan's operations centre in Rantau last night was due to a payment dispute, according to police. Negeri Sembilan acting police chief Mohamad Mat Yusop said a 50-year-old man, who tried to mediate in the dispute, was injured in the incident, the New Straits Times reported. “It started with verbal exchanges between two groups. The man tried to put a stop to it but ended up being beaten up instead. “It is understood that the victim was trying to mediate after some quarters were unhappy with payment. “It soon escalated into pushing and shoving between them,” he was quoted as saying. He added that police were deployed to the scene but the fight had ended. Mohamad said the victim had lodged a police report and cops are looking for witnesses to assist in the investigation. The fight broke out shortly after news circulated that Harapan's Dr S Streram was defeated in the Rantau by-election. Among the conversation heard during the fight were blame being hurled at one another over Harapan's loss. Streram was trounced by BN's Mohamad Hasan, who won with a 4,510-vote majority. Mohamad, the acting Umno acting president, garnered 10,397 votes to Streram's 5,887, while independent candidates R Malar and Mohd Nor Yassin received 83 votes and 79 votes respectively.